I don’t really like living in such a wet place, I am a desert girl. I don’t like the mold and mildew and just the fact that nature seems intent on taking over at any given moment. And thank you, I had forgotten how much I enjoyed it. I gave it up when the 3 boys were old enough to get into it and distract me, but I keep thinking I should take it up again. I know what you mean about one step forward and five backward – we all have times like that, I think. Your rain sounds horrendous – I hope it’s stopped now or your next project will have to be an ark. Thanks, I loved making the ghosts, but I know posting things midweek they don’t get comments so I don’t know if they get seen. I had much younger eyes when I did it! LOL thanks. 10″ of rain! That’s terrible – I hope you didn’t suffer any damage to your home. the footstool is gorgeous and I am looking forward to seeing pics of your sweater pillows. Mostly, because this is an area that gets hurricanes we are prepared for large amounts of rain, but still, you worry about roofs and leaks, because it happens! Thank you, it was a labor of love (I loved my Mother in Law, she was a very nice person and I was blessed to know her for 30 years). I hope the sweater pillows will make an appearance! I love the table top ghosts – I have book marked that for next holidays (they won’t twig its not halloween!). Amazing embroidery! Thank you for stopping by, and I hope you can do them or something like that. I was thinking of trying to make a Santa with that idea. Of course that will require some major tweaking! The crewel work is beautiful… know what you mean about working up to the wire (that’s my Christmas Eve most years!) It looks so clean and fresh, especially after all this time. Great piece of work. I don’t know how she kept it so clean, I know she used it because I remember her sitting with it under her feet as she read or did needlework herself (she did some needlepoint and a little crewelwork also, and a few other things). Thank you for the nice words. I absolutely love the colours and design of the footstool. I’m so glad it was/is well loved. It’s always nice to have made something that was enjoyed, and somehow to have it circle back into your life is also very sweet. I can imagine it perhaps living with a granddaughter of mine one day. I love family things that get passed down. Sorry to hear about the rain. I love the ghost (it looks very cute rather than spooky) I also admire your foot rest. Very nice. Pillows from old sweaters – now that’s something I’d like to see. Soryy to hear about your weather hope it’s improving. 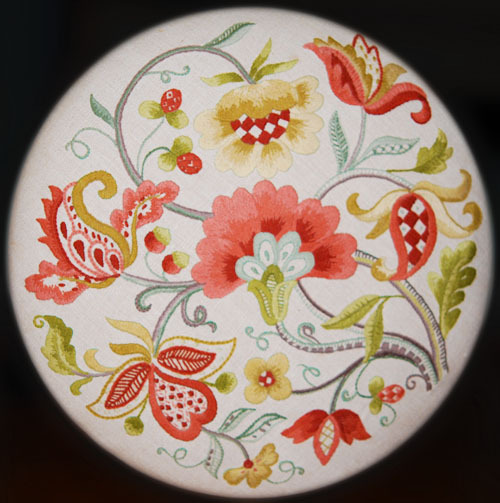 Your crewel work is exquisite a real family heirloom. Thank you. And I do hope to have some pillows for next week, if the roof gets done! Or even if it doesn’t. That crewel work is stunning. Sure it was treasured by your mum when so much work went into it. Thank you. It’s not raining at the moment, but it’s supposed to rain at least one more day. I love that footstool – it is amazing and how wonderful that it has come full circle back to you. Hope the rain has subsided and things start looking up. The footstool is a work of art – i would be so proud of creating something like that. Good Luck with all the bad weather – an excuse to stay in and craft! Love the ghosts – will do them next year! I will look forward to ghost photos! And thank you, I am a little pumped to try something like the footstool again, but maybe a pillow instead. I love the fantasy flowers in crewel work and the jewel colours. Your footstool is beautiful, a real family heirloom! Absolutely gorgeous. I wish I had the patience for crewel work – I’m even struggling with counted cross stitch on linen! Believe it or not, I’ve done counted cross stitch and I found it more difficult. First, you have to keep track of where you are, and it’s the same stitch over and over so I found it less interesting. The crewel is always something new. But probably to each her own. Your footstool is a real treasure, my Grandfather done crewel work, he started doing it during WW1, so much patience. That’s awesome, do you have any of his work? My Father in Law did beautiful needlepoint. We have a few of his pieces (I will post some photos). I don’t know how to do that tho. But his stuff was lovely. There is no reason men cannot do wonderful needlework. In fact (and he may not want me saying!) my husband finished a beautiful strawberry tray I had started years ago. It is lovely. I will post a photo of it too. It’s the only thing he ever did tho. Thank you so much. But I really don’t have that much talent. It was an awesome kit. Wonderful embroidery. I really thought it was a painted plate!!!!! What a beautiful piece of embroidery, I am so pleased that it came back to you. I have been looking how to follow your blog but, not being that computer literate, I don’t know how but wanted to respond to your comments on my blog about bonfires. You triggered another memory from those days when we had an old carthorse and if it hadn’t been working we had to exercise it. He was soooo wide that our feet just stuck out at the sides, Saddle, what saddle, no reins either, hung on to his main for dear life. Oh yes, I agree, those were the days. I will have another go at trying to follow you now. I get confused on how to follow (and sometimes even reply!) to various blogs because they are all different. I even get confused on mine because it is all set up by my darling son who understands. I had a previous one that I did myself but it was much less complex (but did less too). If you want to subscribe, there are various buttons, but I think it depends on which you prefer. Most things I follow I do with the RSS feed as it seems to work best for me (I have a Mac, and that may be why).